Scene of the crime. Inside: A converted tin building, legendary board shapers, up-and-coming-surf weirdos, cool boards, cool people, hot chicks, free beers and a full sized stage featuring a string band playing Fiddler on the Roof tunes. Rad. 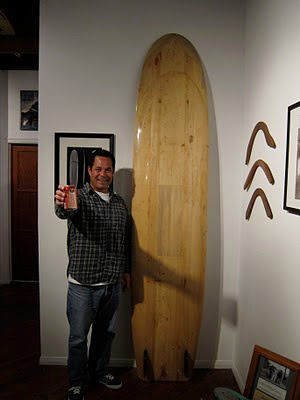 Simmons twin fin reproduction- I salute you.